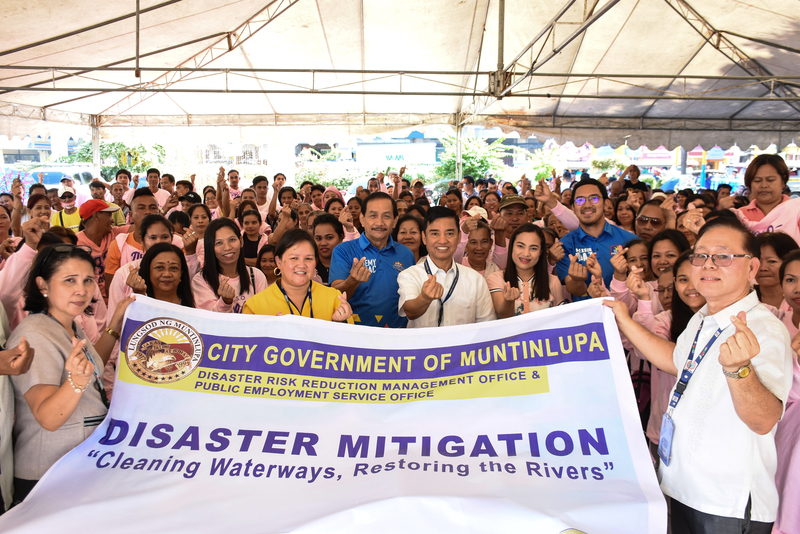 The local government of Muntinlupa strengthens its disaster mitigation initiatives and deploys workers in cleaning waterways. Muntinlupa Mayor Jaime Fresnedi leads the distribution of cleaning materials to TUPAD worker-beneficiaries from the city’s eight barangays last January 14. TUPAD or Tulong Panghanapbuhay sa Ating Disadvantaged/Displaced Workers is a community-basedshort-termemployment for underemployed and seasonal workers for a minimum period of 10 days. The TUPAD project is facilitated by the Public Employment Service Office, in cooperation with the local Environmental Cluster and Muntinlupa City Disaster Risk Reduction and Management Office. Also shown in the photo are PESO Muntinlupachief Glenda Aniñon, former Vicemayor Temy Simundac, Brgy. Poblacion Kgd. Alexson Diaz, and Ms. Paty Katy Boncayao.